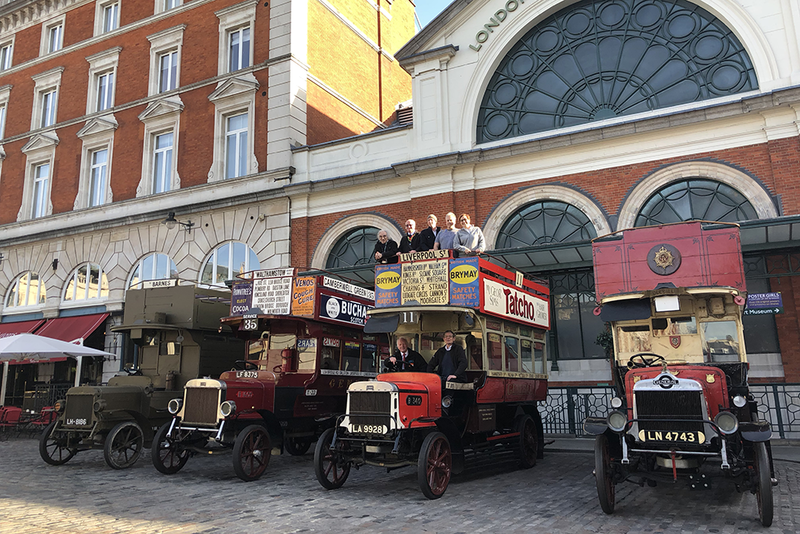 Thanks to funding from the Heritage Lottery Fund and London Transport Museum Friends, London Transport Museum is close to completing Battle Bus – the civilian story of the First World War, a five-year programme to commemorate the centenary of the First World War which has taken place between 2014-2018. The Battle Bus project has included the restoration into operational condition of a 1914 London bus, B2737, and a five-year community programme delivered by apprentices and volunteers, which examined different aspects of the war’s impact on ordinary Londoners, and explored key themes over each year of the commemoration. The B-types, were London’s first reliable, mass-produced motor buses. Introduced in 1910, they rapidly replaced horse buses on the Capital’s streets. When war broke out, over 1,000 of these vehicles, a third of London’s bus fleet, were requisitioned for war service. They served as troop transports and ambulances, some were converted into lorries or even mobile pigeon lofts. B2737 was among the requisitioned vehicles, although it is not known where it served. The restoration of B2737, known as Battle Bus, was completed in June 2014. It was restored to its original red and cream London General Omnibus Company (LGOC) livery. 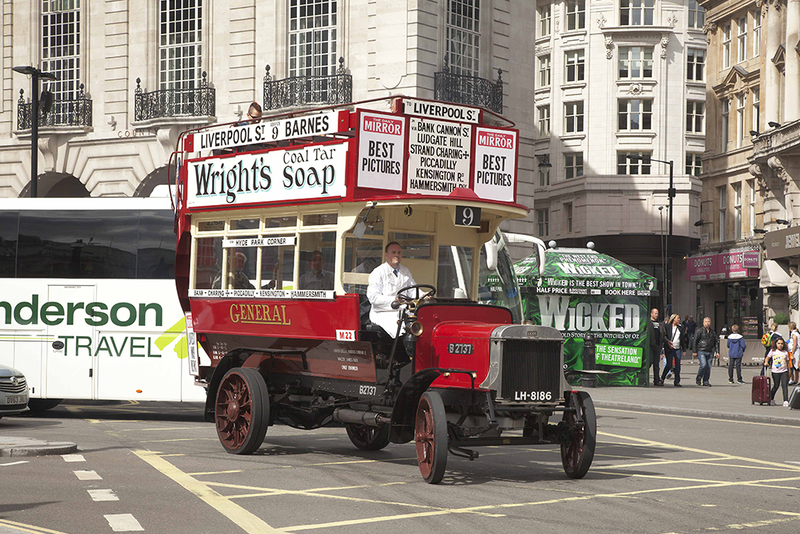 Throughout 2014, as part of the Museum’s celebration of the Year of the Bus, B2737 participated in events across London, including a cavalcade of 48 buses displayed on Regent Street; a recreation of route 9, from Barnes to Liverpool Street which it originally ran on; London bus garage open days; the Shuttleworth Airshow; the Worshipful Company of Carmen’s Cart Marking Ceremony; Routemaster 60; the Lord Mayor’s Show, and the National Service of Remembrance. In September, the bus was converted into a military troop carrier. The windows were fitted with protective boarding, and the body was painted military khaki. The conversion was carried out in the Museum, in public view, and captured on time lapse cameras. Following the military conversion, the bus departed for a commemorative tour of the Western Front. For ten days, the bus and a mobile exhibition toured Belgium and France, visiting locations where London Buses are known to have served. The tour included the bus participating in the Last Post Ceremony at the Menin Gate in Ypres, Belgium, and a visit to Bus House Cemetery, named after the wreck of a London bus that was hit by a shell and remained where it was hit through the war. To ease the labour shortage created by war, women were recruited for a variety of roles in the transport industry for the first time from 1915. One of the most visible and most controversial of these was the role of bus conductor. 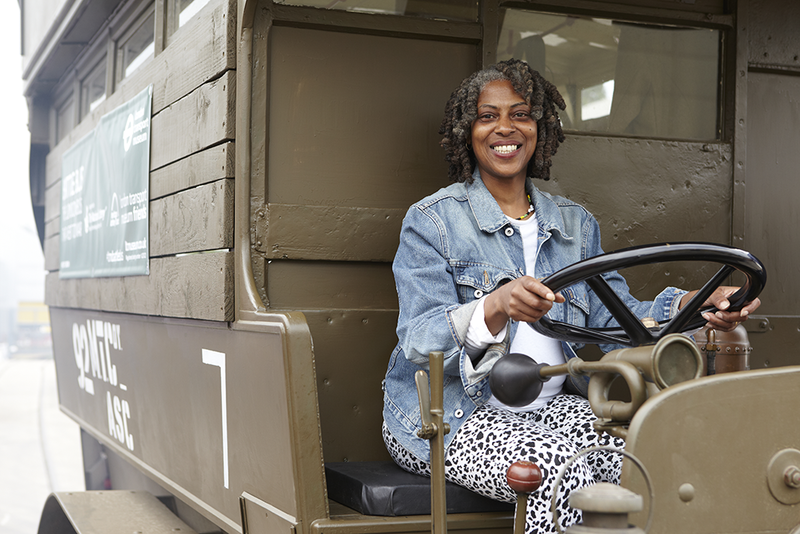 The Battle Bus learning project commemorated the role of women in the war effort with a programme that engaged female bus drivers. They explored the experiences of wartime conductresses and other women working in transport during the war, and reflected on their own experiences 100 years later. Their experiences were featured in a pop-up exhibition that launched at the Museum and went on to tour bus garages and libraries in parts of London associated with the B-type story. The participants were also offered the chance to experience driving Battle Bus, and chalking their messages on the khaki livery. Battle Bus Apprentice, Hannah Steele supported a group of young people who developed Battle Bus inspired activities for families at public events at Fire Power, The Royal Military Museum in Woolwich and Westbourne Park Bus Garage Open Day. Their activities featured an original story ‘Barney’s Adventure’ which tells the tale of Barney and Beatrice, two B-type buses separated by war. After its tour of the Western Front, Battle Bus embarked on a tour of the UK in 2015. The bus and its volunteer crew attended 18 public events, including visits to Beamish Open Air Museum, Crich Tramway Village, Hull, and Reading. It successfully completed the Historic Commercial Vehicles Society London to Brighton road run in May. In August it was taken to Bristol, to commemorate the buses crossing over to the continent from Avonmouth Docks during the war. Marking the centenary of the Battle of the Somme, Battle Bus travelled once again to France for a commemorative tour that visited towns and villages along what was the front line in 1916. 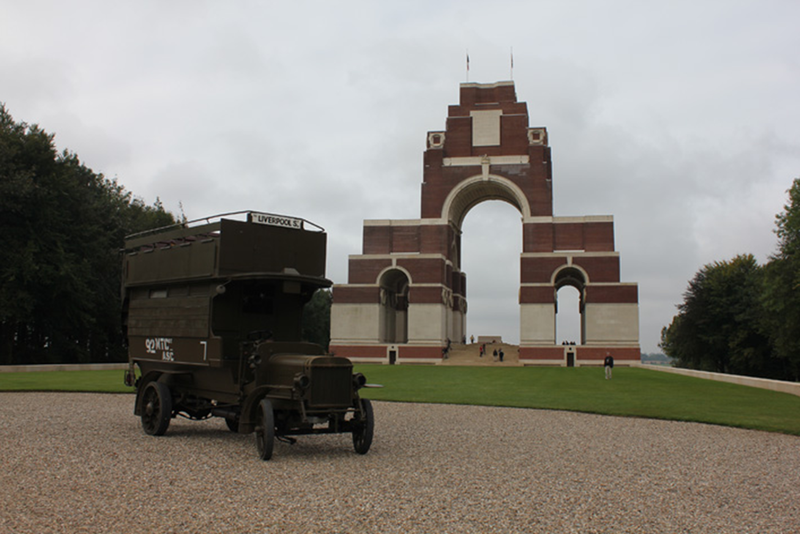 The bus was displayed at the Thiepval Memorial on 1 July – now the sole veteran present at the commemoration. The Battle Bus learning project explored the role of underage soldiers and the heavy casualties of the war. Working with successive groups of young volunteers who each passed their work on to the next group to use, a collaborative community exhibition was produced. A group of university students researched their chosen themes to create the basis for the exhibition. A group of young men from Northumberland Park Community School in Tottenham explored the themes through film and animation. They also visited the Somme battlefields, locating the graves of soldiers whose stories they had learnt about during the project. In addition, they had the opportunity to lay a wreath of poppies during the Last Post Ceremony at the Menin Gate on behalf of the Museum and in commemoration of all transport workers who sacrificed so much for the war effort. A third group of young people, led by Battle Bus Apprentice Lamare Hart, produced poetry and spoken word, and performed at the opening of the resulting exhibition: From Tottenham to the trenches. The exhibition contained panels based on the first group’s work and videos produced by the second group. It was launched at Bruce Castle Museum in Tottenham, and toured other local venues, including the Markfield Beam Engine and Museum. In 2017, the learning team worked with two Year 4 classes from Lancasterian Primary School in Tottenham and two Year 6 classes from Lyndhurst Primary School in Camberwell. They explored stories of the Home Front and the themes of the Battle Bus, to understand the role of children during the war. Using comic books as their inspiration and working with a professional illustrator, the groups created original stories and artworks which were used to form an exhibition for each school: Home Front Heroes. 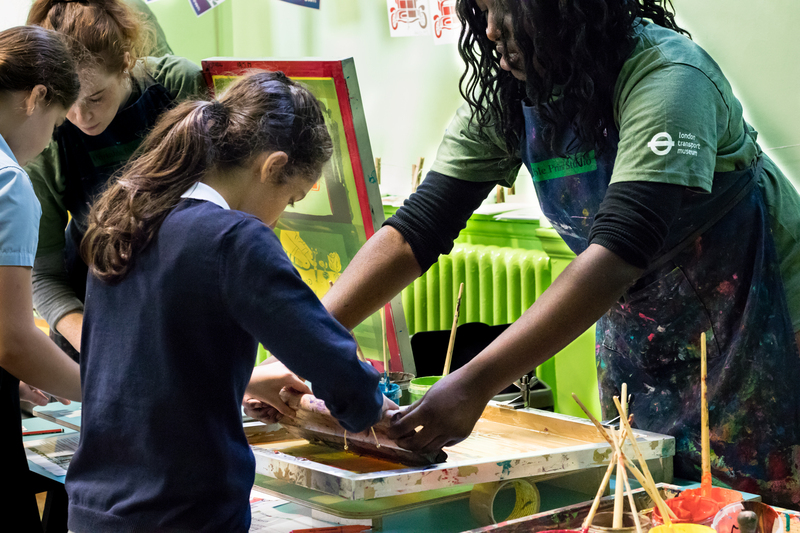 A second element of the project, led by Battle Bus Apprentice Joyce Zale, saw the team work with young people and a screen print artist to produce original designs and lead screen print workshops for museum visitors and students from the above mentioned primary schools. 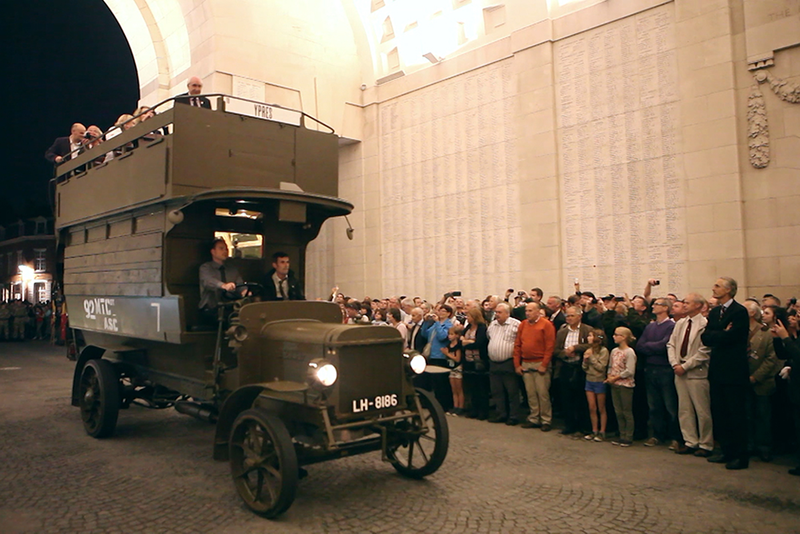 Battle Bus spent a week on display at the British Motor Museum’s First World War event. It also attended the centenary of Biggin Hill Airport where it was explored by a record number of visitors. Battle Bus has continued touring the UK throughout 2018. In July it visited the National Memorial Arboretum, and took part in the Tracks to the Trenches event at Apedale Valley Railway. To commemorate the end of the war, London Transport Museum brought all the remaining B-type buses together for one day and displayed them in Covent Garden outside the Museum. Of the nearly 3,000 buses that were built, only four remain today. They all played slightly different roles during and after the war. B2737 was restored to commemorate the buses and transport workers’ sacrifice. B1609 which stayed in London service during the war was recently restored by its owner. B340, also owned by London Transport Museum, carried wounded troops in London during the war, and became the first bus to be preserved for a collection in 1924. B43 was requisitioned for war service and became a mobile war memorial in 1920, taking part in Armistice Day parades, driven behind the London Transport workers. Nicknamed Ole Bill, it was presented to the Imperial War Museum in 1977. The community learning project has focused on commemoration, with volunteers of all ages working together to explore the meaning of remembrance. Research volunteers dug deep into the Museum’s archives to uncover individual stories of transport workers across the theatres of war. Their research was turned into an exhibition which was open to Museum visitors from Saturday 20 October until Sunday 28 October. Further project volunteers took part in creative workshops with an installation artist to create ‘Forget me Not’ – a hanging artwork made up of over 100 screen printed flowers, symbolic of the hand embroidered postcards send by soldiers to loved ones back home. This year’s Battle Bus Apprentice, Kamiah Cowell, led a group of young filmmakers on a project to create a film piece focusing on the theme of commemoration. The film is in the final editing stages and will be launched in December. This five-year commemoration of the centenary will end with a fitting tribute to the civilians whose lives were forever changed by war: B2737 Battle Bus and B340 will participate in the event at the Cenotaph on Armistice Day 2018, A Nation’s Thank You, before going on public display at London Transport Museum. The Battle Bus programme could not have been possible without the support and commitment of many people: particular thanks go to the Heritage Lottery Fund, London Transport Museum Friends, our Apprentices, Outreach and Research Volunteers, Vehicle Supporters Group, community partners and to everyone that has joined us at events over the last five-years.